Greater Portland Bible Church has a rich history of sending individuals and families from within our community as our representatives to nations and people groups around the world. Our partnerships with them, as well as our partnerships with other agencies and organizations, exist for the purpose of meeting the varied needs of people and making known the transforming story of Jesus. We therefore focus our efforts on people groups and cultures which have only limited engagement with the God of the Bible or with true followers of Jesus. Would you like to learn more about global missions? The Perspectives coure is an excellent way to shift your world view. By participating in Perspectives, every believer can find a way to live with vital, strategic significance in God’s global purpose. The Perspectives course is offered at various times throughout the year - check their website for exact dates and locations. This is by no means an exhaustive list. The individuals and families involved in these efforts have dedicated themselves to long-term solutions rather than quick fixes, taking up permanent residence in the areas of need. They do it because the love of Jesus compels them to love freely, with a lavishness and recklessness that Jesus exemplified. It is a love that goes beyond borders, prejudice, cultural differences or political and religious ideology. If you would like to learn more and pray about the regions and countries in which our Global Partners serve, click the highlighted areas of the map below to be taken to Operation World, an organization providing current and informative prayer guides for nations and geographic areas. 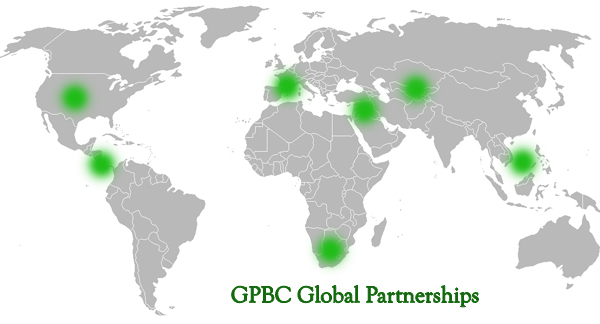 Our global partnerships are funded by the generous pledges and contributions of the members and friends of Greater Portland Bible Church and by occasional fundraising events. These funds are given in addition to financial support (tithes/offerings) for the church and are budgeted separately from the general budget of the church. Our budget is formed on a 12-month commitment from our community. The budget year starts July 1 and ends June 30. To make an online donation to support our Global Partners click here and choose "Missions/GP Donation" on the drop down menu. We invite your participation in our global partnerships through your contributions of time, energy, and money. Please contact Wayne Williams at for information about how you can be involved or if you would like to be updated on Global Partner news. If you would like to make a pledge to the Global Partnership Budget, please fill out and submit the following form. Thank you! Please prayerfully consider what you might pledge above and beyond your general tithes and/or offerings in partnership with our Global Partners around the world. Enter your pledge below using one or more combinations of the following three giving methods. Add up the annual total of the three giving options above. This is a new pledge. This replaces a pledge I already submitted. This adds to a pledge I already submitted. If you'd like to set up online giving for this pledge, please click here. Be sure to set giving to start on or after July 1, 2017 for donations to apply to this pledge. Anything else we need to know or you'd like to say? Thanks for your partnership in supporting our global partners! Our budget is formed on a 12-month commitment from our community. The budget year starts July 1 and ends June 30.